Make a difference in your community and the larger human family! Cooking’s Cool is very grateful to have all of you as loyal customers. 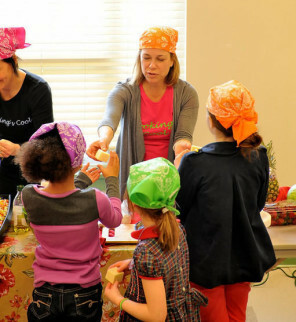 At Cooking’s Cool, we make giving back to our community a priority. On December 3rd, we will host our annual Bandanas for a Cause class at Cooke Elementary this year. We will be making meals for those less fortunate at a local soup kitchen. In the spirit of giving, we will also be making a donation to Food for the Poor. Click on the buttons below for more information about our favorite non-profit organizations, and join us in making a charitable donation this holiday season. Soft Pumpkin Cookies Top 5 Reasons to Cook With Kids!